VISaldo 1.1 free download. 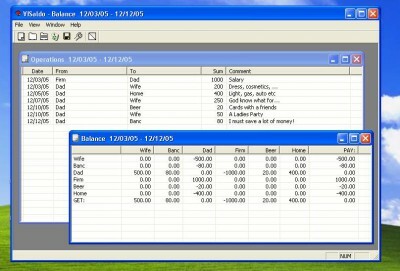 Banc Balance for your Budget with support of MS Access database. Banc Balance for your Budget with support of MS Access database.VISaldo is a financial tool that allows you to record operations. VIGraph - draws a diagramms from your txt-data files. World stocks ticker with diagrams and lists for NYSE, NASDAQ etc and possibility to open a lot of quotes and lists together. VIBio - Biorythms with diagramms and comments. VIWeb is an Internet Browser that gives you the opportunity to open a lot of websites together and store selected texts to a Database. NumFun is an application that helps you exercise math operations.